Woolworths (Proprietary) Limited is a respected chain of over 400 retail stores and offers a selected range of quality clothing, food, homeware, beauty and financial services under its own brand name in South Africa, Africa and the Middle East. The Woolworths Food Division’s Sustainable Food Quality and Safety Management program introduced an innovation, quality, and safety management framework to support the largely private label business and ultimately ensure profitability. Quality and safety risks and hazards in the supply chain could have resulted in costly recalls, potential loss of customer trust, and erosion of the value of Woolworths Brand.Woolworths established an integrated program for management of quality and safety across the supply chain. 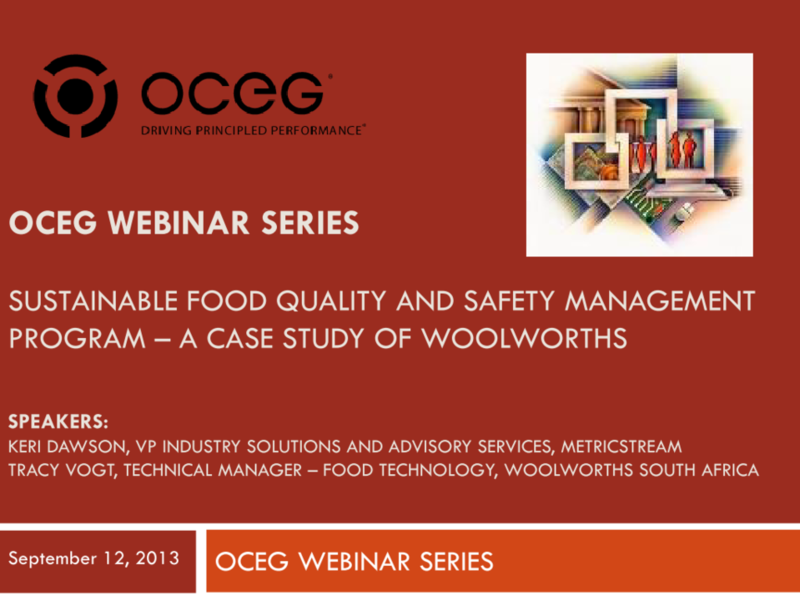 The webinar will provide further insights into the best practices implemented by Woolworths to increase efficiency in food quality and safety programs, ensure compliance with regulations, and strengthen overall brand image, which in turn, won them the 2013 OCEG GRC Achievement Award. We have emailed instructions to access Sustainable Food Quality and Safety Management Program – A Case Study of Woolworths Slide Deck to . Make sure the email arrives in your inbox: either add "support@oceg.org" as a safe sender to your email platform, or if you use Gmail, drag our email into your Primary tab.